The scapula is also known as the shoulder blade. It articulates with the humerus at the glenohumeral joint, and with the clavicle at the acromioclavicular joint. In doing so, the scapula connects the upper limb to the trunk. It is a triangular, flat bone, which serves as a site for attachment for many (17!) muscles. In this article, we shall look at the anatomy of the scapula – its bony landmarks, articulations and clinical correlations. The costal (anterior) surface of the scapula faces the ribcage. It contains a large concave depression over most of its surface, known as the subscapular fossa. The subscapularis (rotator cuff muscle) originates from this fossa. 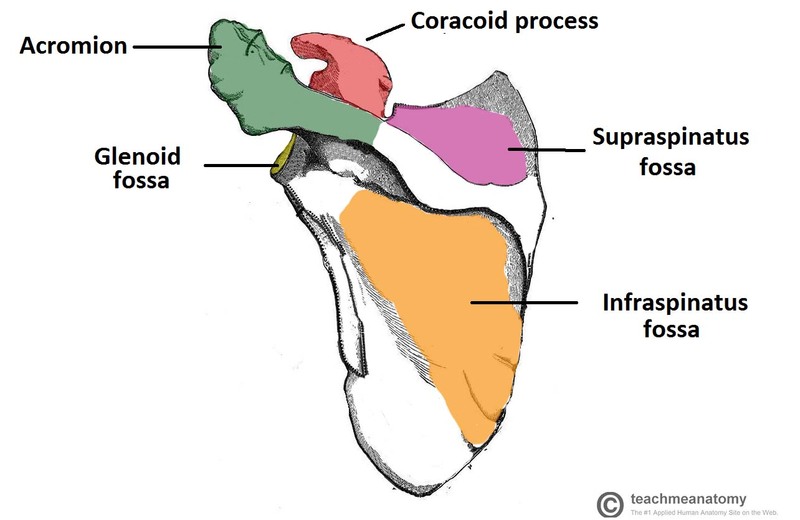 Originating from the superolateral surface of the costal scapula is the coracoid process. It is a hook-like projection, which lies just underneath the clavicle. The pectoralis minor attaches here, while the coracobrachialis and biceps brachii (short head) muscles originates from this projection. Fig 1 – The costal surface of the scapula. Glenoid fossa – a shallow cavity, located superiorly on the lateral border. It articulates with the head of the humerus to form the glenohumeral (shoulder) joint. Supraglenoid tubercle – a roughening immediately superior to the glenoid fossa. The place of attachment of the long head of the biceps brachii. 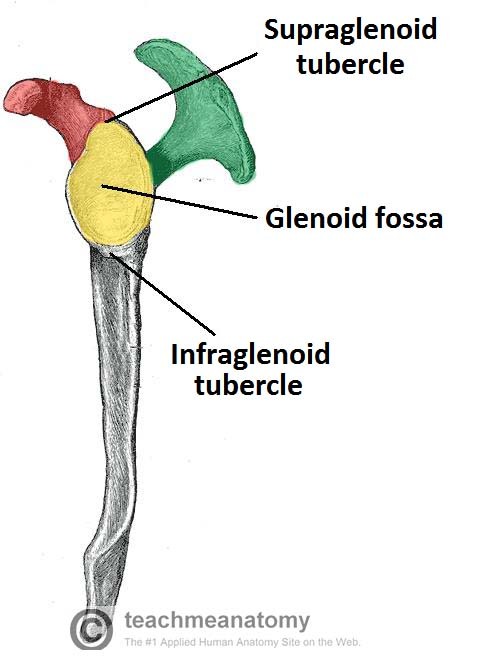 Infraglenoid tubercle – a roughening immediately inferior to the glenoid fossa. The place of attachment of the long head of the triceps brachii. Fig 2 – Lateral view of the scapula. The posterior surface of the scapula faces outwards. It is a site of origin for the majority of the rotator cuff muscles of the shoulder. Spine – the most prominent feature of the posterior scapula. 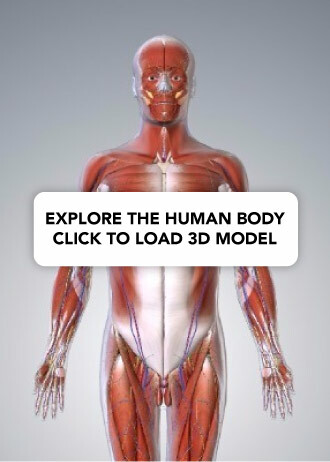 It runs transversely across the scapula, dividing the surface into two. Acromion – projection of the spine that arches over the glenohumeral joint and articulates with the clavicle at the acromioclavicular joint. Infraspinous fossa – the area below the spine of the scapula, it displays a convex shape. The infraspinatus muscle originates from this area. Supraspinous fossa – the area above the spine of the scapula, it is much smaller than the infraspinous fossa, and is more convex in shape. The supraspinatus muscle originates from this area. 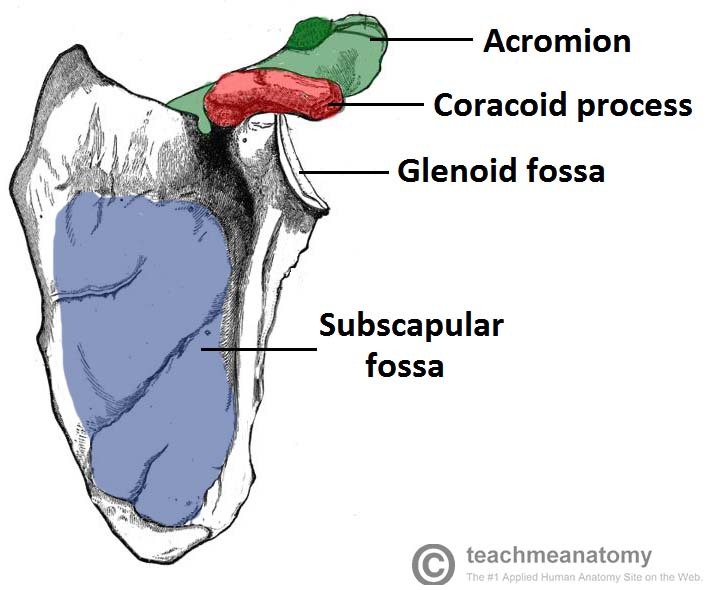 Fig 3 – The posterior surface of the scapula. Glenohumeral joint – between the glenoid fossa of the scapula and the head of the humerus. Acromioclavicular joint – between the acromion of the scapula and the clavicle. Fractures of the scapula are relatively uncommon, and if they do occur, it is an indication of severe chest trauma. They are frequently seen in high speed road collisions, crushing injuries, or sports injuries. The fractured scapula does not typically require fixation as the tone of the surrounding muscles holds the pieces in place for healing to occur. The serratus anterior muscle originates from ribs 1-8, and attaches the costal face of the scapula, pulling it against the ribcage. The long thoracic nerve innervates the serratus anterior. If this nerve becomes damaged, the scapula protrudes out of the back when pushing with the arm. The long thoracic nerve can become damaged by trauma to the shoulder, repetitive movements involving the shoulder or by structures becoming inflamed and pressing on the nerve. What is the name given to the concave depression on the costal surface of the scapula? Where does the short head of the biceps brachii attach? Which part of the scapula articulates with the humeral head?